Boarding of the Inspiration Hornblower is typically at the Harbor Drive Hornblower terminal. 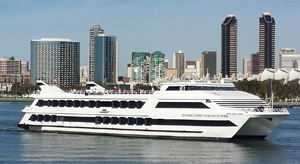 Typical San Diego Harbor cruises entail a relaxing bay tour featuring photographic points of interest such as the San Diego Skyline, Point Loma, Seaport Village, the USS Midway, Star of India, and the Coronado Bay Bridge. 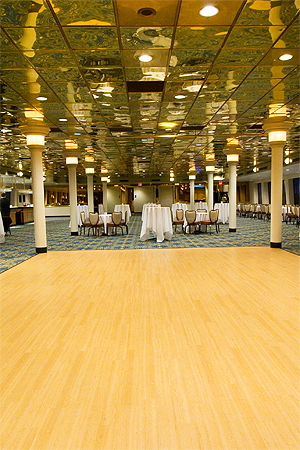 San Diego’s largest charter vessel, the Inspiration Hornblower is a 222 foot mega yacht with a dining and cocktail capacity of 1000 guests. 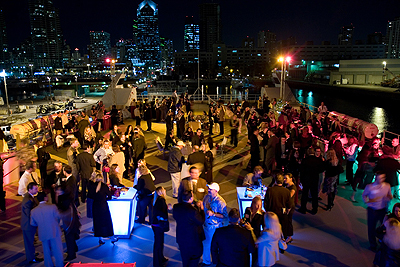 Imagine your event aboard San Diego’s most elegant charter yacht, the Inspiration. Watch the sun dip below the Pacific Ocean as you sip cocktails on the expansive sun deck. 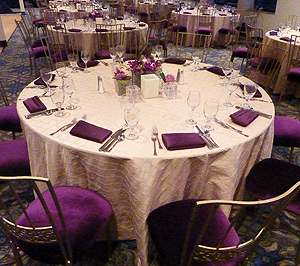 Enjoy a four course meal as you gaze at views from Point Loma to the Coronado Bridge. 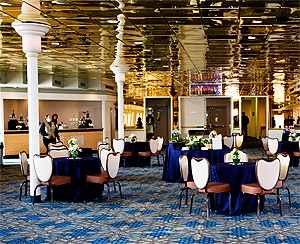 With gourmet cuisine prepared fresh on board, impeccable service, unlimited entertainment options and formal seating, the Inspiration Hornblower is the perfect venue for your next spectacular San Diego event. 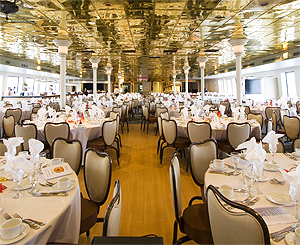 With 28,000 square feet of space, two magnificent enclosed decks with comfortable seating for up to 500 guests per deck, Inspiration is perfect for galas, meetings, private dinners, or team building events. 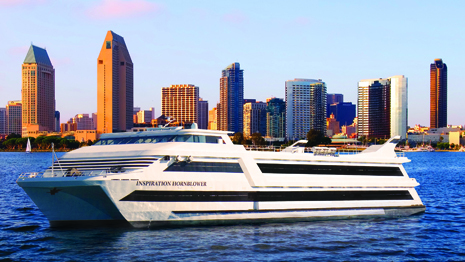 Inspiration Hornblower also features an expansive sky deck rising 30 feet off the water, providing 360 degree views of downtown San Diego and the Big Bay. The event possibilities are endless. 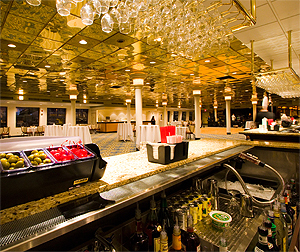 Whatever your occasion to charter a private yacht from San Diego Bay Cruises, the Inspiration mega yacht is ready to accommodate your event and your party.